Call Trucks Only Internet Department 602-354-7623 for all the specs and to schedule your test drive! Carfax One Owner GMC Yukon XL with 3rd row seating, towing package, and premium sound. Why does this vehicle look so great? The CARFAX report shows it's only been owned by one owner. Outstanding craftsmanship and artisanal refinements abound with this GMC Yukon XL SLE. Take home this GMC Yukon XL SLE, and you will have the power of 4WD. It's a great feature when you need to drive over tricky terrain or through inclement weather. First Oil Change on us, with every vehicle purchase. Ask if this vehicle qualifies for our Lifetime Engine Warranty! *Diesel and high performance engines are not applicable. Trucks Only has been in business for over 40 years. Our customers have helped us to earn and maintain the A+ rating with the Better Business Bureau and we have been honored to achieve the Customer Satisfaction Award with DealerRater 3 years in a row! Call Trucks Only Internet Department 602-354-7623 for all the specs and to schedule your test drive! Shipping is available across the United States! Please let us know how we can help you find the right solution for your needs! Located at 837 W Apache Trail in Apache Junction. Call Doris 480-671-5600 for complete details. Beautiful Carfax One Owner Toyota 4Runner 4x4 SR5 in great condition! First Oil Change on us, with every vehicle purchase! Ask if this vehicle qualifies for our Lifetime Engine Warranty! *Diesel and high performance engines are not applicable. Trucks Only has been in business for over 40 years. Our customers have helped us to earn and maintain the A+ rating with the Better Business Bureau and we have been honored to achieve the Customer Satisfaction Award with DealerRater 3 years in a row! Call Doris at 480-671-5600 for complete listing details! Located at 837 W Apache Trail in Apache Junction. Call Doris 480-671-5600 for complete details. Beautiful Carfax One Owner Toyota 4Runner 4x4 SR5 in great condition! Call Trucks Only Internet Department 602-354-7623 for all the specs and to schedule your test drive! Beautiful Lincoln Navigator with leather, quad seating, premium sound, moon roof, and towing package. Marked by excellent quality and features with unmistakable refined leather interior that added value and class to the Lincoln Navigator You'll quickly realize how much you will need a navigation system once you are stopping for directions or looking up addresses on your phone instead of looking at the road. This Lincoln Navigator 2WD features a navigation system that will free you of these unnecessary headaches. First Oil Change on us, with every vehicle purchase. Ask if this vehicle qualifies for our Lifetime Engine Warranty! *Diesel and high performance engines are not applicable. Trucks Only has been in business for over 40 years. Our customers have helped us to earn and maintain the A+ rating with the Better Business Bureau and we have been honored to achieve the Customer Satisfaction Award with DealerRater 3 years in a row! Call Trucks Only Internet Department 602-354-7623 for all the specs and to schedule your test drive! Shipping is available across the United States! Please let us know how we can help you find the right solution for your needs! Call Trucks Only Internet Department 602-354-7623 for all the specs and to schedule your test drive! Drive home in your new pre-owned vehicle with the knowledge you're fully backed by the CARFAX Buyback Guarantee. This Dodge Durango GT is an incredibly versatile vehicle that is a "must have" for any family. First Oil Change on us, with every vehicle purchase. Ask if this vehicle qualifies for our Lifetime Engine Warranty! *Diesel and high performance engines are not applicable. Trucks Only has been in business for over 40 years. Our customers have helped us to earn and maintain the A+ rating with the Better Business Bureau and we have been honored to achieve the Customer Satisfaction Award with DealerRater 3 years in a row! Call Trucks Only Internet Department 602-354-7623 for all the specs and to schedule your test drive! Shipping is available across the United States! Please let us know how we can help you find the right solution for your needs! Located at 837 W Apache Trail in Apache Junction. Call Doris 480-671-5600 for complete details. The CARFAX report for this 2018 Dodge Durango GT highlights that it's a One-Owner vehicle, and for good reason. A One-Owner vehicle gives you the feel of owning a new vehicle without paying the new car price. First Oil Change on us, with every vehicle purchase. Ask if this vehicle qualifies for our Lifetime Engine Warranty! *Diesel and high performance engines are not applicable. Trucks Only has been in business for over 40 years. Our customers have helped us to earn and maintain the A+ rating with the Better Business Bureau and we have been honored to achieve the Customer Satisfaction Award with DealerRater 3 years in a row! Shipping is available across the United States! Please let us know how we can help you find the right solution for your needs! Call Trucks Only Internet Department 602-354-7623 for all the specs and to schedule your test drive! This well-maintained Ford Expedition Limited comes complete with a CARFAX one-owner history report. This Ford Expedition Limited is an incredibly versatile vehicle that is a "must have" for any family. Intricately stitched leather and ergonomic design seats are among the details in which test drivers say that Ford Expedition is in a league of its own First Oil Change on us, with every vehicle purchase. Ask if this vehicle qualifies for our Lifetime Engine Warranty! *Diesel and high performance engines are not applicable. Trucks Only has been in business for over 40 years. Our customers have helped us to earn and maintain the A+ rating with the Better Business Bureau and we have been honored to achieve the Customer Satisfaction Award with DealerRater 3 years in a row! Shipping is available across the United States! Please let us know how we can help you find the right solution for your needs! . Located at 837 W Apache Trail in Apache Junction. Call Doris 480-671-5600 for complete details. Jeep Wrangler Unlimited with Rubicon package. Features off-road tires, black wheels. First Oil Change on us, with every vehicle purchase. Ask if this vehicle qualifies for our Lifetime Engine Warranty! *Diesel and high performance engines are not applicable. Trucks Only has been in business for over 40 years. Our customers have helped us to earn and maintain the A+ rating with the Better Business Bureau and we have been honored to achieve the Customer Satisfaction Award with DealerRater 3 years in a row! Shipping is available across the United States! Please let us know how we can help you find the right solution for your needs! Located at 837 W Apache Trail in Apache Junction. Call Doris 480-671-5600 for complete details. When you purchase a vehicle with the CARFAX Buyback Guarantee, you're getting what you paid for. Gone are the days of SUVs being the size of a tank and handling like one. This Jeep Wrangler Unlimited is a perfect example of how SUVs have evolved into vehicles that are as refined as they are rugged. No matter the terrain or weather, you'll drive at ease in this 4WD-equipped vehicle. With exceptional safety features and superb handling, this 4WD was engineered with excellence in mind. The Wrangler Unlimited Rubicon has been lightly driven and there is little to no wear and tear on this vehicle. The care taken on this gently used vehicle is reflective of the 45,438mi put on this Jeep. First Oil Change on us, with every vehicle purchase. Ask if this vehicle qualifies for our Lifetime Engine Warranty! *Diesel and high performance engines are not applicable. Trucks Only has been in business for over 40 years. Our customers have helped us to earn and maintain the A+ rating with the Better Business Bureau and we have been honored to achieve the Customer Satisfaction Award with DealerRater 3 years in a row! Shipping is available across the United States! Please let us know how we can help you find the right solution for your needs! 2012 Jeep Wrangler with very low miles. Features include: power windows and locks, AM/FM/CD/Aux audio options, cruise control, and hands-free call support. Together with our State-of-the-Art Service and Accessories Center, we are very proud to offer an EXCLUSIVE Lifetime Lift Warranty on most of our lifted inventory! Is this vehicle not EVERYTHING you want? Ask your representative what accessories and upgrades might be available! First Oil Change on us, with every vehicle purchase. Ask if this vehicle qualifies for our Lifetime Engine Warranty! *Diesel and high performance engines are not applicable. Trucks Only has been in business for over 40 years. Our customers have helped us to earn and maintain the A+ rating with the Better Business Bureau and we have been honored to achieve the Customer Satisfaction Award with DealerRater 3 years in a row! Call Trucks Only Internet Department 602-354-7623 for all the specs and to schedule your test drive! Shipping is available across the United States! Please let us know how we can help you find the right solution for your needs! Located at 837 W Apache Trail in Apache Junction. Call Doris 480-671-5600 for complete details. If you're going to purchase a pre-owned vehicle, why wouldn't you purchase one with CARFAX one-owner report. On almost any road condition, this Jeep Cherokee Trailhawk offers solid performance, reliability, and comfort. Handle any terrain with ease thanks to this grippy 4WD. Whether you're on a slick pavement or exploring the back country, you'll be able to do it with confidence. Intricately stitched leather and ergonomic design seats are among the details in which test drivers say that Jeep Cherokee is in a league of its own. First Oil Change on us, with every vehicle purchase. Ask if this vehicle qualifies for our Lifetime Engine Warranty! *Diesel and high performance engines are not applicable. Trucks Only has been in business for over 40 years. Our customers have helped us to earn and maintain the A+ rating with the Better Business Bureau and we have been honored to achieve the Customer Satisfaction Award with DealerRater 3 years in a row! Shipping is available across the United States! Please let us know how we can help you find the right solution for your needs! Call Trucks Only Internet Department 602-354-7623 for all the specs and to schedule your test drive! 2WD Expedition EL XLT 2WD with 3rd row seating, towing package, and the EcoBoost 3.5L V6 engine. First Oil Change on us, with every vehicle purchase. Ask if this vehicle qualifies for our Lifetime Engine Warranty! *Diesel and high performance engines are not applicable. Trucks Only has been in business for over 40 years. Our customers have helped us to earn and maintain the A+ rating with the Better Business Bureau and we have been honored to achieve the Customer Satisfaction Award with DealerRater 3 years in a row! Call Trucks Only Internet Department 602-354-7623 for all the specs and to schedule your test drive! Shipping is available across the United States! Please let us know how we can help you find the right solution for your needs! Call Trucks Only Internet Department 602-354-7623 for all the specs and to schedule your test drive! Tahoe LT with leather, quad seating, third row, premium sound, and moon roof. First Oil Change on us, with every vehicle purchase. Ask if this vehicle qualifies for our Lifetime Engine Warranty! *Diesel and high performance engines are not applicable. Trucks Only has been in business for over 40 years. Our customers have helped us to earn and maintain the A+ rating with the Better Business Bureau and we have been honored to achieve the Customer Satisfaction Award with DealerRater 3 years in a row! Call Trucks Only Internet Department 602-354-7623 for all the specs and to schedule your test drive! Shipping is available across the United States! Please let us know how we can help you find the right solution for your needs! Call Trucks Only Internet Department 602-354-7623 for all the specs and to schedule your test drive! This AWD-equipped vehicle will handle beautifully on any terrain and in any weather condition your may find yourself in. The benefits of driving an all wheel drive vehicle, such as this Cadillac Escalade Luxury, include superior acceleration, improved steering, and increased traction and stability. 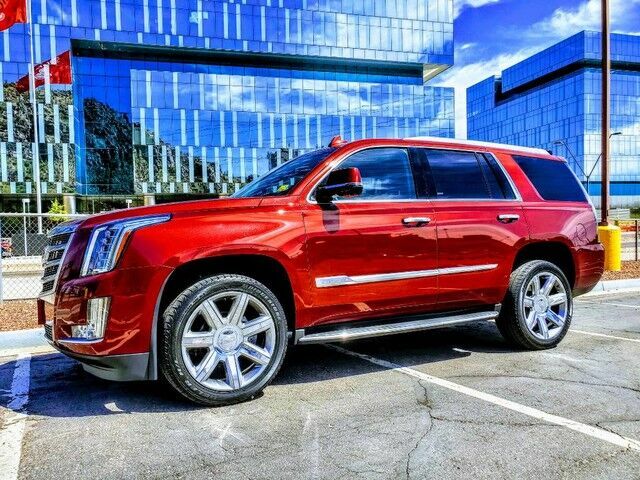 Marked by excellent quality and features with unmistakable refined leather interior that added value and class to the Cadillac Escalade Engineered with the latest in technology and features, this vehicle is an automobile lover's dream. This vehicle comes with upgraded wheels for improved appearance. First Oil Change on us, with every vehicle purchase. Ask if this vehicle qualifies for our Lifetime Engine Warranty! *Diesel and high performance engines are not applicable. Trucks Only has been in business for over 40 years. Our customers have helped us to earn and maintain the A+ rating with the Better Business Bureau and we have been honored to achieve the Customer Satisfaction Award with DealerRater 3 years in a row! Call Trucks Only Internet Department 602-354-7623 for all the specs and to schedule your test drive! Shipping is available across the United States! Please let us know how we can help you find the right solution for your needs!